The ancient Chinese therapy of acupuncture has gained considerable steam in the United States during the past 20 years or so. Today, more than three million Americans receive the treatment each year, and the number just continues to grow. If you’ve had acupuncture, let us know what you think about it. If you’re just considering it, here are a few particulars to help you make a more informed decision. In Chinese medicine, health depends on the balance of the extremes (yin and yang) of the life force, or energy, known as chi. This life force flows through pathways in the body called meridians. The Chinese believe illness results when there’s an imbalance of chi. The acupuncture treatment involves inserting very thin needles through your skin at specific points on your body that correspond to the meridians. By accessing the meridians, the treatment brings the chi back into balance and helps you feel better. Many in the medical community, however, remain skeptical of its benefits. Western medicine has long known about acupuncture. An article that ran in The New York Times in 1854 is the first known to report on it in the United States. More than 160 years later, many health care practitioners are still wary of its value. However, during the century plus since that first article was written, a lot of research has been conducted and more has become known about this alternative therapy’s effectiveness. For example, a 2012 meta-analysis, which is a study of existing research, compared acupuncture to standard medical treatment for musculoskeletal pain, chronic headaches and osteoarthritis. The researchers found a statistically significant benefit to acupuncture when compared to standard treatment. One reason for this, scientists speculate, is acupuncture needles create tiny injuries where they are inserted. These injuries cause the body’s immune system to react by sending anti-inflammatory proteins and other healing substances to the injury site. By revving up the immune system, it is primed to manage bigger problems. Another possibility the researchers suggest is the increased blood flow and immune system substances now present at the injury site could help remove accumulated cellular byproducts that may be leading to certain painful conditions. A popular way acupuncture is being used in this country is as a complementary treatment along with standard medical care. 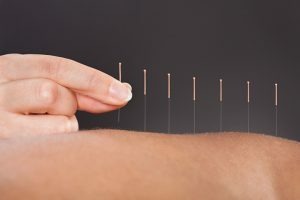 Western health care practitioners see acupuncture points as places where muscles, connective tissue and nerves can be stimulated. One theory is that the treatment incites neurotransmitters to release the body’s own pain-killing chemicals. A 2017 meta-analysis of 29 clinical trials seemed to back this approach to using acupuncture. It looked at nearly 18,000 patients with chronic neck, low back, knee or headache pain. The study found that adding acupuncture to standard medical care, such as anti-inflammatory medications, significantly reduced the number of headaches and migraines. It also reduced the severity of neck and low back pain, and the pain and disability associated with osteoarthritis. Acupuncture has been shown to be effective in treating pain, but it also treats other types of disorders. It’s been used to help with conditions related to cancer treatment, such as nausea and vomiting, and severe dry mouth. One study showed it is even effective at treating anxiety and depression. The World Health Organization reports that acupuncture is effective for treating 28 conditions, but there’s evidence to suggest it may have therapeutic value for many more. If you’re thinking about trying acupuncture, consider this: it is a less costly treatment option than many standard therapies, and it has very few side effects.